To survey (both acoustically & mechanically), design, manufacture, deliver and install the required enclosure, this being of approximate overall sizes 10.5m long x 2.5m wide x 2.3m high. The overall design & construction (bespoke to this particular manufacturing process) being fit for purpose in providing a safe working environment for operations & maintenance personnel – practical, cost-effective & functional, whilst reducing ambient noise levels in the surrounding shop floor area. Totally demountable for major maintenance works (machine strip-down & overhaul) with panels having hidden fixings to enhance the aesthetics, whilst also being of a robust, durable construction, resistant to machinery lubricants, oils & greases etc. Virtually full width x full height access both ends for personnel, and for manually loading long lengths of raw materials & the removal of finished parts, with a number of strategically positioned acoustically insulated vision panels so that the cutting process can be overseen safely from outside the facility. To utilise all available space inside, the enclosure walls fully stiffened to mount tooling racks, equipment and PPE, with sealed service(s) apertures where required for electrics, control wiring, pipework, etc. Attenuated, natural draught ventilation employed to ensure that the temperature rise inside the enclosure was acceptable and allowed the housed equipment to operate in a normal manner whilst maintaining the acoustic integrity of the enclosure. 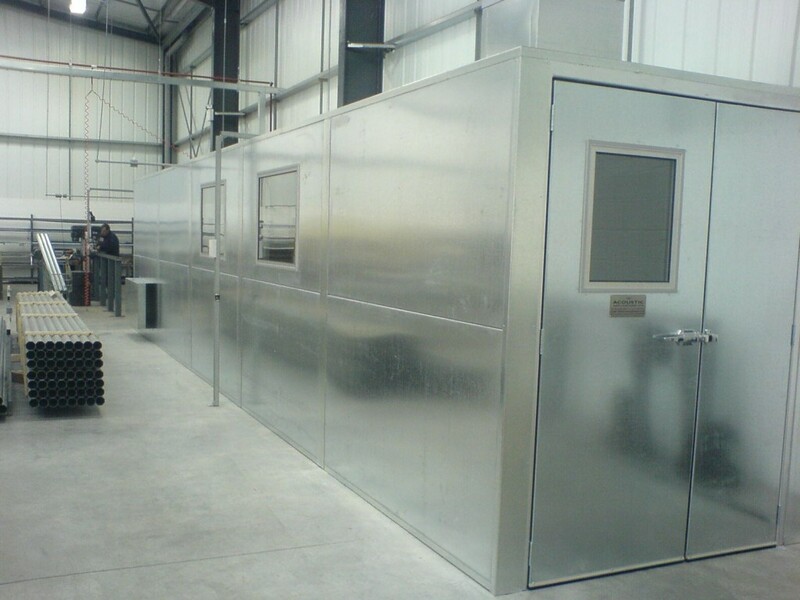 The enclosure reduced operational noise levels by 27dB, bringing factory ambient noise levels in the surrounding area to well below the First Exposure Action Level (80dBA) of the Control of Noise At Work Regulations 2005 and exceeding the customer's expectations.